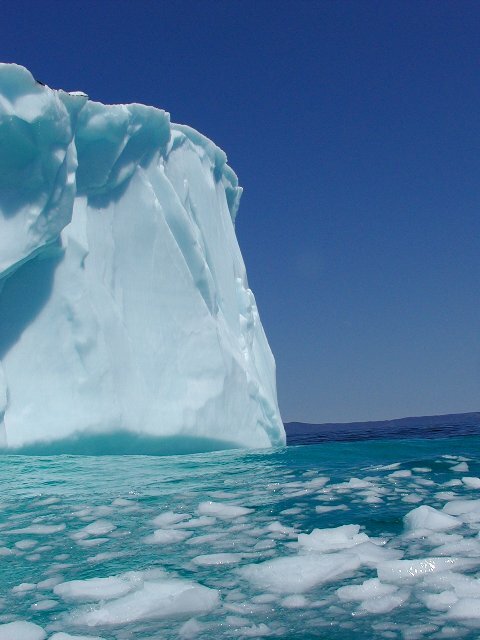 A huge iceberg in Conception Bay, Newfoundland. Not too many of us Newfoundlanders here, especially award winning photographers such as yourself. The feature in the Herald a few weeks ago was amazing, by the way. You should put a link to your website in your profile; the folks around here could learn a bunch from you. Regarding the comment about the blue cast - ice from glaciers has often been compressed at much higher pressures than regular ice cubes that you'll be used to seeing up close. That compression does actually mean that icebergs have a blue hue. This is just how I remember them looking, hue and all. I like the different hues of blue in this one. i love the shades of blues & aqua! Unreal beauty. What an amazing part of the world, and you captured the image perfectly. Awesome. Tell me when you go here again; I'll come with! Super composition.You found the right light here, and I love the point of view so close to the water. Awsome shot. You really get a good idea of just how big those bergs are and I love the cool colors. Good job. The many different tones of blue in this photo lead to a masterpiece image I don't see too often. Wonderful - 10. Nice choice of subject - horizon needs straightening, though. Is this faked, I wonder? Where was the camera positioned for this shot? Wow! I wouldn't want to fall in these waters. Brrrr! WOW!!! Where do you find something like that? Very nice. Excellent! Number one for this challenge, IMHO. Stunning! Colors are magnificent. Clarity and composition are very good also. Very nice, where did you shoot this? 9. Breathtaking! I love the color in this. Cool... this looks a little tilted, but it is really a neat photo. Where were you to take this photo? The blues in here are awesome. I wish there was something else there to catch my eye though. However it fits the challenge pretty well and you could definitely put in type. Nice job. Very nice, excellent composition. The different shades of blue work together very well here. The blue cast is too strong and makes the ice look unnatural. Otherwise, a very capturing image. Proudly hosted by Sargasso Networks. Current Server Time: 04/18/2019 08:18:57 PM EDT.